Researching Food History - Cooking and Dining: Nesselrode Pudding (ice cream) created by Careme... or was it Mony? The chestnut based ice cream contained - like fruit cakes - citron, currents, raisins, eggs, and other ingredients was named for a Russian diplomat. Count Karl von Nesselrode (1780-1862; painting from 1818) entered Paris after the defeat of Napoleon in 1814 with Tsar Alexander I. They were able to enjoy the works of many fine French chefs, including Careme who was Talleyrand's cook at the time. Another Parisian, the "distinguished cook" Monni, went to Russia to cook for Nesselrode and named the new dish after his employer. 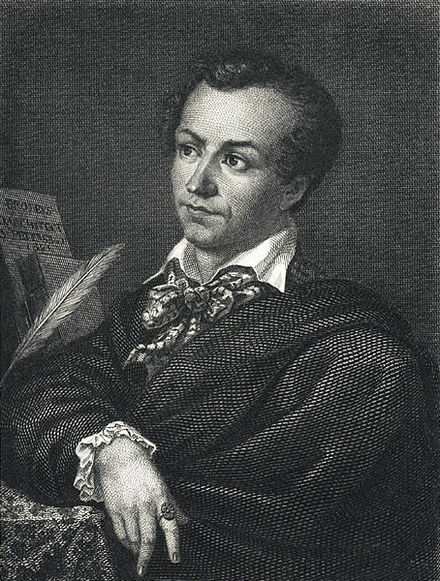 Marie Antonin Careme (1784-1833) was striving to make a name for himself, and would become famous; forever known from his creations and cookbooks. 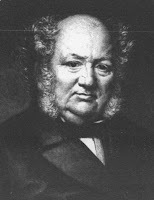 Jules Gouffé (1807-1877) worked seven years for Careme starting in 1823, and also knew Mony. Careme's admission that Mony created the Nesselrode Pudding appeared with his recipe (below) in his book Le Cuisinier Parisien, 1828, but the true story didn't even make it into a recent biography of Careme - Ian Kelly's Cooking for Kings. “M. Monni, Parisian and distinguished cook, lives for ten to twelve years the capital of the North. [Russia] I am convinced that the pudding of chestnuts that I composed and described in the first edition of this book, gave him the idea of this ice pudding, which he gave the name of the Russian Lord (a la Nesselrode) for whom he prepares dinner every day. But in my turn, I hasten to make the French name for this dessert. I am always astonished that we have the habit of giving foreign denominations to the excellent dishes we compose; why this, when the French cuisine is recognized universal cuisine?" 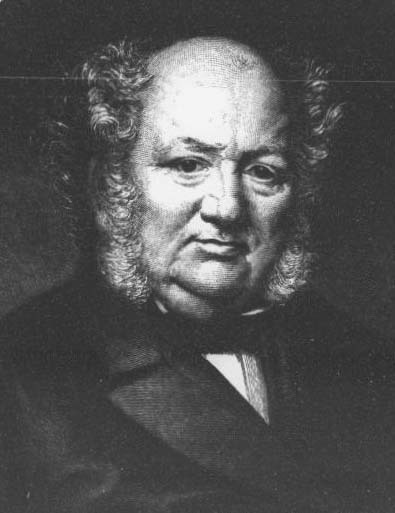 Careme claimed that Monni's ice cream recipe was based on his boiled chestnut pudding (Careme was not the first chestnut pudding) in a cloth with chunks of chestnuts and no fruit. Also it used 36 roasted chestnuts, and the Nesselrode used 40. Pouding aux Marrons et un Rum – (Chestnut Pudding, with Rum) by Careme. The recipe detailed to roast and skin thirty-six fine chestnuts, add rice flour, eggs, suet, sugar, bitter macaroons, raisins, quartered chestnuts, cream, nutmeg, rum and put into buttered napkin and boil. When Careme died in 1833, a couple English translations of his work were published in London. Only the recipe itself was included in French Cookery, 1836, no mention was made of Monni. When it appeared in Eliza Acton's very popular Modern Cookery, 1845 his famous name would be forever linked to Nesselrode Pudding. Acton didn't even have to try the recipe. "We give Monsieur Carème's own receipt for this favourite and fashionable dish, not having ourselves had a good opportunity of proving it; but as it originated with him he is the best authority for it." Gouffe, a Frenchman, included his friend Mony's recipe in his Royal Cookery Book of 1867. He had “been favoured with the recipes of both these puddings by one of my old friends, M. Mony, many years chef at Count Nesselrode's…” Image from his cookbook "Le Livre de patisserie." “M. Monni, Parisian and distinguished cook, lives for ten to twelve years the capital of the North. [Russia] I am convinced that the pudding of chestnuts that I composed and described in the first edition of this book, gave him the idea of this ice pudding, which he gave the name of the Russian Lord (a la Nesselrode) for whom he prepares dinner every day. But in my turn, I hasten to make the French name for this dessert. I am always astonished that we have the habit of giving foreign denominations to the excellent dishes we compose; why this, when the French cuisine is recognized universal cuisine? 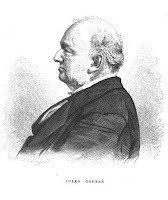 I must also warn that the recipe I am going to describe was given to me in part by Mr. Etienne, the most skillful man of the modern office; he also enjoys the reputation of being the first officer in Paris. I hasten to render this testimony of esteem to the talent of a man justly renowned. 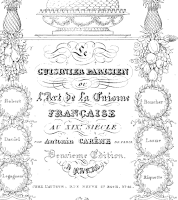 I will also add with satisfaction to the well-known name of Mr. Étienne, names also renowned in French cuisine; they had escaped my memory, and I hasten to make a brilliant repair to these distinguished men: such as M. Farcie, former chef of the kitchens of Napoleon…. I will describe some frozen pudding recipes. After having peeled forty beautiful chestnuts cooked in water, you pile them perfectly well, adding a few spoonfuls of syrup; then you pass them on a silk screen, and mix them in a terrine with two glasses of syrup (one pound of sugar clarified with a vanilla bean) with vanilla, as much cream, and twelve fresh egg yolks; you place this appliance on a moderate fire, being careful to stir it constantly for a moment with a spatula, a little before the boiling takes place; you remove the cream to pass it to the white cheesecloth. The apparatus being cold, you deposit it in a sarbotiere, by joining a glass of maraschino, and have it taken like ice-cream; when it is taken, you add an ounce of candied citron, cut into cubes; two idem currants [raisin de Corinthe], and as much seeded muscat [large grape/raisin from Spain] (you must have marinated the day before these grapes with maraschino and vanilla powdered sugar); everything is well combined, you mix a plate of cream cheese, and three egg whites prepared in an Italian-style meringue machine. When the pudding is perfectly hit by the ice, you roll it into a tin mold that is half of a large pineapple cut on its diameter, so that the pudding is shaped like a dome imitating the pineapple. This mold must be closed in the style of those which the officers usually employ for frozen cheeses. The device is carefully placed in the mold, you also place it in the sarbotière, then masking it with crushed ice and saltpetre. It is essential to observe not to throw cold water, which is done in the bottom of the sarbotière, as you work the apparatus, turning the sarbotière from right to left; this repeated movement causes the melting of the ice, and it is precisely this icy water which precipitates the freezing of the apparatuses which one wants to ice. I am going to give some details of how to strap the sarbotiere: it is by pouring crushed ice into its bucket, on which you sow a few handfuls of saltpetre; then you place the sarbotiere on it; and after having also surrounded it with ice and saltpetre, you wipe the lid and the edge perfectly; then you pour out the apparatus and cover the sargo-trap: a quarter of an hour later you start to turn the sarbotiere from right to left, and when the cream begins to freeze after the walls, you detach it with the rod, so that the apparatus is also taken; then you close the sarbotiere and do not leave it, always turning it and from time to time you take care to detach the cream of the walls to amalgamate it in one and the same body consistent, and when it is perfectly taken, you finish the pudding according to the processes indicated above." Turn the pudding out of the mould on to a napkin, on a dish; and serve with the sauce in a boat. I have been favoured with the recipes of both these puddings by one of my old friends, M. Mony, many years chef at Count Nesselrode's; I can, therefore, in this case, as in that of the Charlottes a la Chateaubriand and a la Sicilienne, guarantee the authenticity of my recipes, as I receive them direct from their inventors, to whom I am happy to convey here my tribute of thanks and good fellowship. 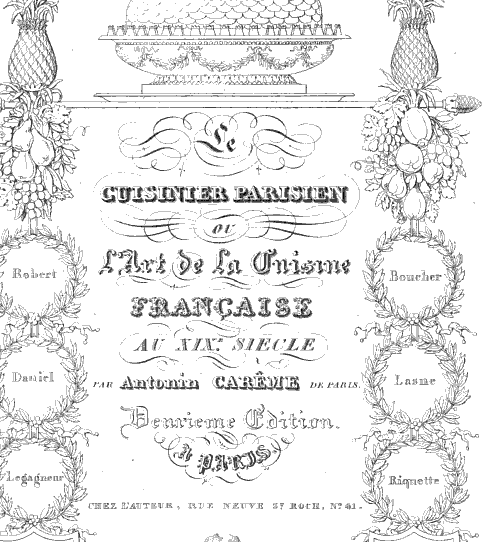 Careme's cookbook was translated into English as French Cookery and published in 1836. Nine years later British author Eliza Acton included the recipe, which she did not make. "We give Monsieur Carème's own receipt for this favourite and fashionable dish, not having ourselves had a good opportunity of proving it; but as it originated with him he is the best authority for it. It may be varied in many ways, which the taste or ingenuity of the reader will easily suggest. Boil forty fine sound Spanish chestnuts quite tender in plenty of water, take off the husks, and pound the chestnuts perfectly with a few spoonsful of syrup; rub them through a fine sieve, and mix them in a basin with a pint of syrup made with a pound of sugar clarified, and highly-flavoured with a pod of vanilla, a pint of rich cream, and the yolks of twelve eggs; thicken the mixture like a boiled custard; when it is cold put it into a freezing pot, adding a glass of maraschino, and make it set as an iced cream; then add an ounce of preserved citron cut in dice, two ounces of currants, and as many fine raisins stoned and divided (all of which should be soaked from the day before in some maraschino with a little sugar); the whole thus mingled, add a plateful of whipped cream, and the whites of three eggs prepared as for Italian meringue. When the pudding is perfectly frozen, mould it in a pewter mould of the form of a pineapple, and place it again in the ice till wanted to serve. Preserved cherries may be substituted for the raisins and currants. Chestnuts, 40; syrup, 1 pint some spoonsful; vanilla, 1 pod; cream, 1 pint; yolks of eggs, 12; maraschino, 1 glassful; citron, 1 oz., currants, 2 ozs. ; raisins, 2 ozs. ; whipped cream, 1 plateful; whites of eggs beaten to snow, 3. When the pudding is perfectly frozen, mould it in a pewter mould of the form of a pineapple, and place it again in the ice till wanted to serve. Preserved cherries may be substituted for the raisins and currants. Obs.—As Monsieur Carème directs the eggs for his Italian meringues to be prepared as follows, he probably intends that they should be mixed with the syrup before they are added to the pudding. Boil together half a pound of the finest sugar, and half a pint of water, until they begin to be very thick, then with a wooden spoon, work the sugar against the side of the pan till it whitens; leave it to cool a little, work it again, and then with a whisk mingle with it the eggs whipped to a very firm froth, which ought to produce a preparation very white, smooth, and brilliant." Prepare a custard of one pint of cream, half a pint of milk, yolks of 6 eggs, half a stick of vanilla, one oz of sweet almonds poumded, 2 1/4 lb of sugar. put in a stew pan over a slow fire, & stir to a proper consistency being careful not to let boil; when cold add a wine glass of brandy; fatially freeze & add1/2 lb of preserved fruit cut small; mix well & mould. (Basket shape generally used). Remember Tutti frutti ice cream? He never went into my tastes of giving ice cream puddings; but many of my confreres serve them in their dinners; and, myself, I found myself forced to use it by the repeated demands of the lords. As a result of these circumstances, and considering that young practitioners might find themselves in such a situation, I decided to describe a few recipes for icy devices. This amiable part of the ice certainly belongs to the office, and not to the kitchen. But such is the empire of fashion; it changes habits and tastes. Yet I seem to have found the causes of these changes in the indifference that the Amphitryons now bring to the productions of the Office. So we count today in Paris few houses renowned for the service of the office; and if the kitchen is affected by this rigid economy, the science of the office suffers even more. Formerly the hostages hastened to seek out the renowned officers; they wanted their feasts to be sumptuous from beginning to end; in a good dinner we liked to find good food, and the sweetness of the sweet sweets of the office. As I said in my Preliminary Address, for a table to be served with elegance and sumptuousness, the kitchen and the galley must give it a mutual appeal. The guests go with a sweet joy of the gastronomic service to that of the dessert. They also like to enjoy the compotes, ice creams and sweet bombons, which are the elegance of the modern galley. Despite these observations, France is still the only country of true gastronomy. The spirit of the century, it must be said, has somewhat changed the habits of European gastronomes, and these changes may become fatal to the art of cooking. 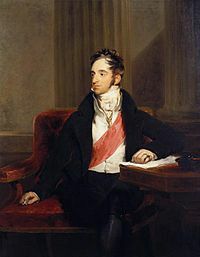 I was assured that the French lords had just formed a club, like those of Great Britain; this noble society must meet one by one and in part to give themselves splendid dinners. May time bring some happy change, in the interest of the host, and the culinary art will retain its brilliance and splendor."